When is the last time you brushed your teeth? This morning? Last night? Do you brush after every meal or just at certain times of the day? Brushing your teeth regularly is an important part of taking care of your dental health, so you want to make sure you do it often. When is the last time you brushed your pet’s teeth? Have you ever brushed their teeth or take them in for dental care for pets? One of the most vital services available today in modern veterinary facilities is feline dental care and canine dental care. Studies show that by the time most dogs and cats are just three years of age, as much as 80 percent will have some degree of dental or periodontal disease. Not only will dental disease cause bad breath beyond the typical “dog breath” that most pet owners know, but it can also lead to a painful mouth and difficulty eating. Other side-effects of dental disease can be more serious, including complications to heart and kidney disease or extreme lethargy. When it comes to dental care for pets, veterinarians and veterinary dental specialists recommend brushing your pet’s teeth to help delay the development of plaque and dental decay. However, some pets will simply not allow this type of treatment to occur, making it difficult to provide any form of consistent care at home. Maintaining your pet’s healthy teeth and gums is vital to their overall health. A dental routine that includes home brushing and regular dental cleanings at the local veterinary clinic is a must. During a routine dental cleaning, most pets are required to be put under anesthesia for their safety, the safety of the veterinary staff, and to ensure that the services are completely provided. An evaluation, as well as cleaning, polishing, and fluoride treatments, are typically given during this type of service. While the pet is under anesthesia, they are monitored at Anchor Animal Hospital in Dartmouth by our staff using a cutting-edge multi-parameter machine. Heart rate, respiratory rate, end-tidal CO2, blood pressure, temperature, and oxygen saturation are all tracked by this machine. While most pet owners understand that the odds are high that their pet will develop some degree of dental or periodontal disease in their lifetime, they may not fully comprehend the risks. Just looking at a pet’s teeth cannot properly account for any decay or disease that is going on below the surface. Approximately 70 percent of the tooth exists below the gum line, making it vital that x-rays and digital radiographs are performed during every dental procedure. This provides access to the sub-gingival health of your pet’s teeth for proper feline dental care and canine dental care. Home dental care is just as critical. Our team will recommend daily brushing with pet toothpaste and dental rinses. A tartar control diet can also be suggested, such as Hill’s T/D Prescription Diet or Healthy Advantage. CET dental chews are great for reducing tartar build-up between visits. Our staff will work with you to find a dental home care plan that works with your lifestyle and your pet. Each pet is different, so we understand that there is no such thing as a one-size-fits-all solution when it comes to dental care for pets. We suggest that dental care for pets should at least be included as part of yearly exams to provide comprehensive vet care for cats and dogs. 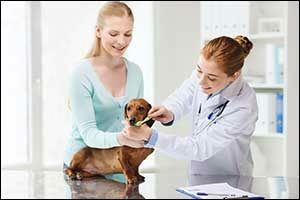 If your pet is diagnosed with a dental or periodontal disease, there are treatment options available that can help. Laser therapy is now available to help your pet’s mouth be as healthy as possible. Therapy lasers reduce inflammation in gums that is caused by gingivitis, reduce pain after extractions, and even increase the healing process. Laser therapy can also be used as a monthly maintenance treatment to slow or reverse gingivitis and slow the formation of tartar. Surgical treatment options are available to remove broken, infected, and otherwise bad teeth with feline dental care and canine dental care services. Contact Anchor Animal Hospital in Dartmouth, MA by calling 508-996-3731 to schedule an appointment, inquire about dental care for pets, or to learn more about all of the comprehensive veterinary services we provide.